The global corporate wellness market is growing at a steady pace, with increase in penetration of corporate wellness services, due to factors such as, increasing health care costs, corporate profit, and focus on employee retention. Additionally, increase in demand for corporate wellness services in emerging economies, such as India and China, is driving the market. The global corporate wellness market was valued at US$ 29,266.9 Mn in 2017. It is projected to reach the valuation of US$ 61,690.9 Mn by 2026, growing at a CAGR of 9% from 2018 to 2026. Corporate wellness programs are designed to support employees understand their health risks, pursue healthy behavior at the workplace, and decrease health care expenditure. Corporate wellness programs consist of health risk assessments, fitness, health screening, weight management, smoking cessation, and nutrition. These programs reduce cost of hospitalization, surgeries, and visits to health care specialists. Moreover, corporate wellness programs increase productivity, decrease absenteeism, and improve quality of life of employees. Promotion of health and well-being of employees through prevention of non-communicable diseases, increase in the number of white-collar employees, and rise in awareness regarding health and wellness in organizations are the major factors driving the growth of the corporate wellness market. According to a report published by the World Health Organization in 2016, globally around 3.4 billion workers are employed in the private sector. A healthy workforce is important for continued economic development, productivity, and sustainable organizational and household income. 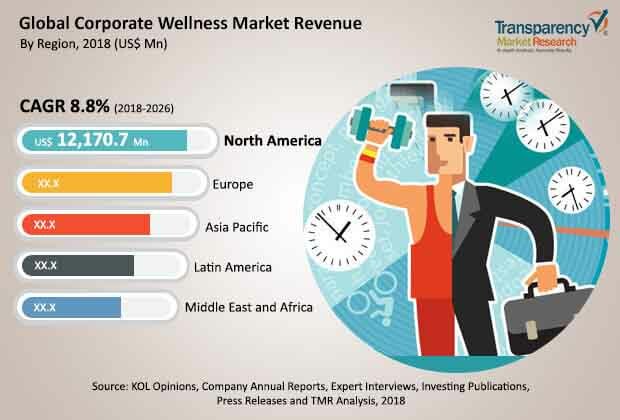 The global corporate wellness market has been segmented on the basis of service type, such as, health risk assessment, fitness, health screening, smoking cessation, weight management, nutrition, and others (stress management, disease management, vaccination, etc.). Health risk assessment and weight management are rapidly growing segments owing to rise in penetration of health risk assessments programs which is highest in the U.S. compared to other regions. It is estimated that more than 75% of employers in the U.S. opts for health risk assessment programs. Moreover, obesity is a rapidly growing health concern across the world. In the last few years, several developed and developing countries have recorded high growth rate of overweight and obese population. In terms of service type, the health risk assessment segment held the leading share of the global corporate wellness market. Health risk assessment a quick and simple way to provide employees feedback regarding their health and guide them with tips to improve it. Health risk assessment is an evaluation of employees’ physical condition and disease risks, along with their overall level of health and fitness. The health care industry is expected to witness significant consolidations and transactions in the next five years. A key factor driving the corporate wellness market is the constantly rising health care expenditure, besides the growing base of insured population. Along with increase in health care expenditure the demand for corporate wellness service is expected to increase in forecast period. Employment and working conditions are the main determinants of health outcomes. Workplaces that promote health and wellness can boast of a healthy and sustainable workforce. Every year, an estimated 36 million people die from non-communicable diseases, and a quarter of the deaths occurs among the working population (age-group of 15-60 years). Non-communicable diseases have significant impact on employee absenteeism, productivity, and the overall economy. Moreover, there are several business benefits associated with preventive measures to control non-communicable diseases at the workplace. In terms of geography, the global corporate wellness market has been divided into five major regions: North America, Europe, Asia Pacific, Latin America, and Middle East & Africa. North America and Europe constituted the leading share of the global corporate wellness market, followed by Asia Pacific, Latin America, and Middle East & Africa. The U.S. dominated the corporate wellness market in North America due to rise in investment and adoption of corporate wellness service, surge in health care costs, and increase in incidence of chronic diseases. Furthermore, the corporate wellness market in the U.S. is driven by increase in adoption of newly introduced corporate wellness plans for fitness, weight management, and nutrition. Europe is the second-leading market for corporate wellness services. Germany is a key contributor to the corporate wellness market in Europe. The corporate wellness market in Asia Pacific is growing rapidly, driven primarily by the developing countries. Growing awareness about corporate wellness programs and rise in expenditure on health care are driving the corporate wellness market in the region. However, lack of availability for corporate wellness services and low penetration of health care facilities are restraining the corporate wellness market in the developing and undeveloped regions, such as Middle East & Africa and Latin America. Key players operating in the corporate wellness market are EXOS, ProvantHealth (Hooper Holmes, Inc.), Wellness Corporate Solutions, ComPsych Corporation, Optum, Inc. (United Health Group), Sodexo, BupaWellness Pty Ltd (BupaGroup), JLT Australia (RecovreGroup), Central Corporate Wellness, TruworthWellness, CXA Group Pte.Limited, and SOL Wellness. Based on service type, the corporate wellness market has been segmented into: health risk assessment, fitness, smoking cessation, health screening, weight management, nutrition, and others (stress management, disease management, and vaccination, among others). Each of the market segments have been extensively analyzed based on the market-related factors such as the number of white-collar employees, region-wise health awareness and government support/rules and regulations, and capital expenditure by the private sector by region. Moreover, historical year-on-year growth have been taken into consideration while estimating the market size. The market size and forecast in terms of US$ Mn for each segment has been provided for the period from 2016 to 2026. The report also provides the compound annual growth rate (CAGR %) for each market segment for the forecast period from 2017 to 2025, considering 2016 as the base year. The overview section of the report explores drivers, restraints, and opportunities that currently impact the corporate wellness market and could influence the market in the near future. Market attractiveness analysis has been provided in the overview section to explain the intensity of competition in the market across different geographies. The competitive scenario among different key players has been evaluated through market share analysis in the competitive landscape section of the report. All these factors are projected to help market players to take strategic decisions to strengthen their positions and increase share in the global corporate wellness market. The corporate wellness market has been segmented into five major regions: North America, Europe, Asia Pacific, Latin America, and Middle East & Africa. The market size and forecast for each of these regions has been provided for the period from 2016 to 2026, along with their respective CAGRs for the forecast period from 2018 to 2026, considering 2017 as the base year. The report provides market size and forecast for major countries in their respective regions. A detailed qualitative analysis of factors responsible for driving and restraining the market and future opportunities has been provided in the overview section. This section of the report also provides with market attractiveness analysis, regulatory scenario, and market share analysis by key players, thus presenting a thorough analysis of the overall competitive scenario in the global corporate wellness market. The key players operating in the corporate wellness market are EXOS, ProvantHealth (Hooper Holmes, Inc.), Wellness Corporate Solutions, ComPsych Corporation, Optum, Inc. (United Health Group), Sodexo, BupaWellness Pty Ltd (BupaGroup), JLT Australia (RecovreGroup), Central Corporate Wellness, TruworthWellness, CXA Group Pte.Limited, and SOL Wellness.